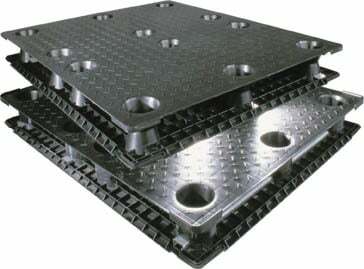 The ideal one-way pallet – it is lightweight, durable, flexible and inexpensive. Molded from a mix of recycled polypropylene that won’t shatter or crumble. The conical pedestal design provides the strength. A quality stackable pallet at a bargain price built to get your product delivered with less damage. Available with or without corner lip. The pallet choice for low density, high volume products. The Light Duty is constructed with recycled polypropylene blends producing a durable and very reasonably priced pallet with a low maintenance cost. Features corner Pedestal Protective Sleeves that cover the corner pedestals and protect them forklift damage. This fully recyclable pallet is great for controlled pallet management systems. Rackable, on either the 40″ or 48″ side, with the addition of optional steel components. Decrease your pallet cycling and increase your profits. Capable of handling a wide range of materials, the Heavy Duty is designed for long life and heavy loads. This pallet is injected molded with a specific polypropylene material which provides a firmer, more durable pallet. The washable non-absorbent surface is easily cleaned for reuse when sanitary conditions are required. This pallet is extremely durable under all handling, storage and weather conditions. Rackable, on either the 40″ or 48″ side, with the addition of optional steel components. It features corner Pedestal Protective Sleeves.